Millionaires Club: Diamond Edition is a 5 reels and 40 paylines video slot game powered by NextGen gaming platform. Total coin sizes for this progressive slot machine are 40. You can play this jackpot slot using coin size of 40p per spins to up to £100 per spin at mobile phones, desktop, laptop and tablets at any NextGen online casino. There are 3 bonus rounds available in this game. Like one is the free spin feature which gives you 10 to 40 free spins and 2x multiplier. This is a progressive slot game which has the capability to make you a millionaire. Millionaires Club Diamond Edition jackpot is a bit like NetEnt’s Mega Fortune. This slot has everything that you might need while gambling online. The soundtrack is awesome, the graphics, the playing arena, the theme and the symbols. The game includes symbols like A, K, Q and J playing cards, expansive watches boxes, sports car, helicopters, yachts and luxury pads. The game also features wild symbol as well as scatter symbol. 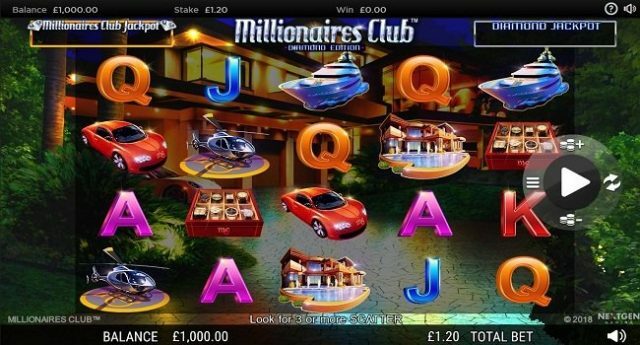 The Millionaires Club Logo is the wild symbol of this slot which can replace all other symbols on your screen except the scatter symbol. The Millionaires Club logo is the most paying symbol as well and it can pay you 20 times of your total stake if you land 5 of these symbols across a payline. You will trigger Club Free Games feature once you hit 3 scatter symbols (MC stamped) on active reel. 3 scatters will give you 10 free spins, 4 scatters will offer you 15 free spins and 5 scatters across a payline will provide you 20 free spins plus a 2x multiplier will also be applied. This feature can be re-triggered and you can get up to 40 free spins. Check this slot out at any Nextgen top casino listed here.